Ella has no talent for evasion. She reveals her emotions without the slightest artifice. Her happiness is so obvious, so transparent. She smiles, laughs, and skips--actually skips--across the room. When she is angry, the emotion is no less obvious, and the source is unmistakable. Often, I catch her glaring, with hooded eyes, at Owen. When angry with her parents, she retreats to the corner and pouts, her anger determining our mood like a bad weather pattern. Since starting Kindergarten, in September, she has revealed new emotions, most notably a strong sense of self-esteem, obvious in her posture, how she straightens her back and tilts her chin upward when speaking about her lessons: counting and writing and coloring in the lines--oh, the profound importance of coloring in the lines! I love it. I love everything about her school. I love the principal, Mr. Mac, who visited our house in August to read Ella a story. I love her classroom, with its primary colors, the gleaming metal pegs where she hangs her backpack, the low chairs, the smell of crayons and pencil shavings and books. I love picking her up after school, at late care, when we walk the corridors, poking our heads into classrooms, or the library, or the gym, which smells of decades of sweat. (The school was built in 1969, the year my brother Scott was born). Ella loves it, too, though she spent the entire summer dreading it. One night in late July, before Mr. Mac had come over and after we had watched Spider-Man 3, she woke around 5:00 AM and padded into our room, crying. "Mommy," she said, half asleep, "I dreamt of Venom. It was almost as scary as the principal coming to our house!" But he came. And she survived. And now whenever Mr. Mac sees her, he shouts out, "Ella!" 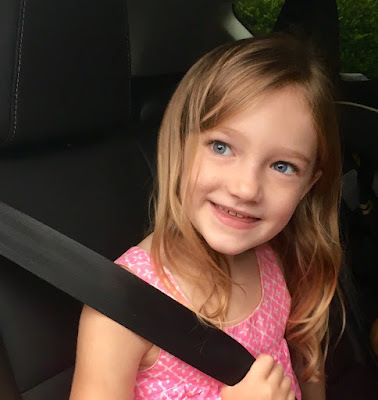 Recently, when I picked her up on a Friday, after Mr. Mac had shouted across a hallway crowded with kids, "Have a good weekend, Ella," I stopped in my tracks to stare at Ella. She was shaking her head and smiling as she tightened her backpack straps to her chest. My God, I thought. She is so proud. I loved it. I loved her. It felt like the best moment of my life. She looked up at me. "Daddy," she said. "STOP." She knew what I was thinking--for I have no talent for evasion. In the hallway, surrounded by children, she was embarrassed by her father. And I loved that, too.